Fifteen years ago, Lester Holt was demoted and being "pushed toward the door" at WBBM, the CBS TV station in Chicago, where he was the main news anchor. Today, he has one of the rarest jobs in TV: anchor of a network evening newscast. "When I sit back and reflect on that journey just weeks from unemployment and to where I am right now, it's gratifying, and it's kind of life-affirming that you can't plan your life sometimes," Holt told Adweek in a wide-ranging interview Monday afternoon. "There are only three of these jobs, and none of them were open or would be open for a long time. So it was not on my radar," Holt said. "I got some advice a long time ago that you always want to prepare yourself if doors open at weird times for weird reasons—and that's exactly what happened." When Holt takes the NBC Nightly News chair this evening, he'll also become the first African-American solo anchor of a network evening broadcast. 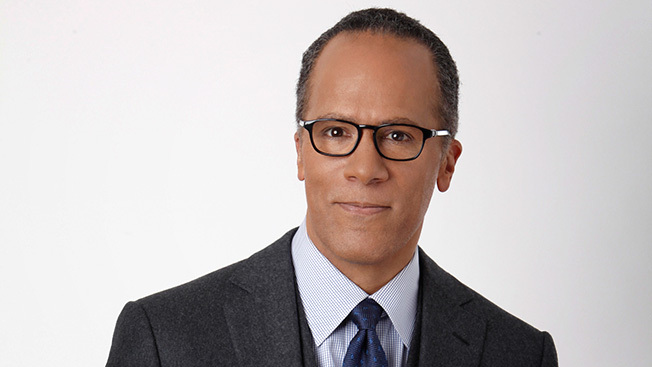 Holt joined NBC News in 2000 as an anchor for MSNBC. He was tapped to anchor the weekend editions of the Today show in 2003, added the weekend editions of Nightly News in 2007 and was named anchor of Dateline NBC in 2011. Holt will continue to anchor Dateline for now, but the future is "up for discussion." Holt's ascension to the top of Nightly News, which finds itself in a tight ratings race with ABC's World News Tonight, follows the decision to permanently remove Brian Williams from the broadcast. Holt and Williams have been friends from the day Holt joined the network. But the two didn't talk about all that's transpired in the last five months until last Thursday after the network revealed change. "We had a very, very good talk and we both acknowledged we would have liked to have had earlier, but that this was awkward for a lot of reasons," Holt said. "We are friends, and nothing that has happened has gotten between us." When Williams returns from his suspension in August, he'll become breaking-news anchor for MSNBC. The network is not ruling out Williams filling in on NBC when news breaks and Holt is unavailable. Holt says it's not for him to judge the outcome. "I knew going into this that that side was going to be taken care of, and that was between Brian and our bosses. I didn't judge it then, and I'm not in a position to judge it now. In many ways, I'm too close. We're friends. As far as I'm concerned, I need to focus on this broadcast and keep moving forward." Holt also says he won't shy away from those late-night talk show appearances, which became a forum for Williams' fabrications. "As they come, we'll evaluate them. I'm the guy who likes to have fun, to poke fun at myself, to play my music and all those things," he said. "But it's certainly with the knowledge that I am a face of NBC News, and I recognize that carries a lot of responsibility."